Enjoy exercising outdoors, but really need a low-impact workout solution, and hate club style gyms? Then the Cardio Walker is right up your alley. 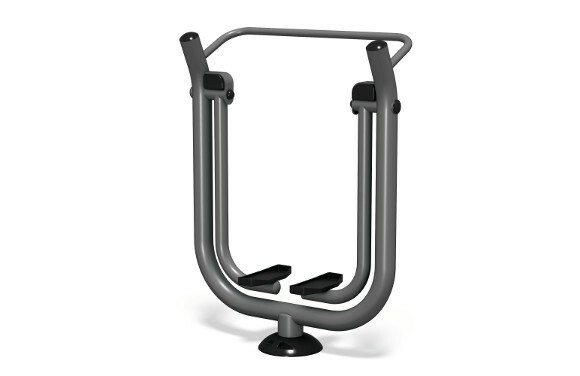 As part of a premium line of outdoor fitness equipment from American Playground Company it provides aerobic fitness and cardio benefits through a smooth striding gazelle-like motion. Users can relax hands on the rails and place feet securely on foot pedals, and, while standing upright, alternate leg strides in smooth motion just like walking or running. With its ergonomically designed handles and slip-resistant foot platforms, the Cardio Walker ensures comfort for park-goers of all fitness levels or experience. The Cardio Walker comes in a black and metallic color finish conforming with typical fitness equipment found in many club style gyms. It is constructed from high-quality, long-lasting materials to withstand years of outdoor use in community parks, senior centers, fitness trails, and more!